A gift that always pleases. 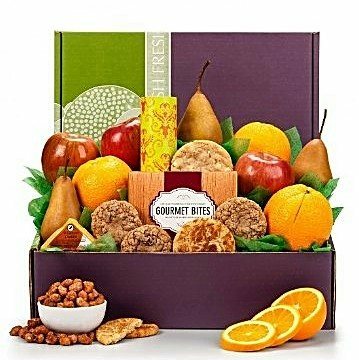 A gift that is combines fresh, healthy fruits with the best bakery fresh cookies and premium Wisconsin cheese. Simply delicious! This gift Includes the following: 3 NW Fuji Apples, 3 California Navel Oranges, 3 Bosc Pears, Northwoods Wisconsin Cheddar Cheese 2 oz, 3 Oatmeal Raisin Cookies, Snickerdoodle Cookie 1 oz, White Chocolate Hazelnut Cookie 1 oz, Toffee Peanuts 2 oz.